Today’s bread takes full advantage of the delight that is a Bourbon-soaked dried cherry, nestling them into a hardly-sweetened scone. Normally, I prefer my scones a bit sweeter, but I’ve cut the sugar here to showcase the natural jammy flavor of the cherries. And, boy, do they pop! Scones, unlike their slightly-richer cousin, the biscuit, naturally cry out for a bit of butter, as they can taste just a touch dry. This is not necessarily a defect; and it makes buying good butter worth every penny. Imagine, then, in the middle of a crumbly bite of scone, the burst of a juicy cherry, soaked to the gills with smoky Bourbon. Oh, my goodness, it’s heavenly. Though it does take some advance planning to soak the cherries, this recipe can otherwise be completed in less than 30 minutes, from measuring ingredients to pulling them from the oven. It’s a good thing, too; the aroma that wafts from the dough, even, is nothing short of seductive. And if you can manage to keep away from them before they’re fully cooled, you’re a better man than I am. 1. Place the cherries in a plastic zip top bag. Add the Bourbon, and squeeze as much air as possible out of the bag before closing. (This maximizes the surface area contact between the fruit and the bourbon, and makes sure no cherries are left dry.) Soak the cherries for at least 8 hours, and up to several days. 2. Preheat the oven to 450° F, and grease a baking sheet or line with parchment paper. 3. In a large bowl, whisk together the flour, cream of tartar, baking soda, sugar, and salt. Add the cold butter and quickly cut in with a pastry blender or fingertips until the mixture resembles coarse meal. Pea-sized lumps are okay. Add the milk, cherries, and Bourbon, and quickly fold together until it just forms a dough, drizzling a little extra milk over any dry spots if necessary. The dough should be quite sticky. 4. Turn the dough out onto a heavily floured surface, and liberally flour the top. Pat into a 1 inch thick round, and cut into 8 equal wedges. Carefully transfer to the prepared baking sheet, and brush the tops with milk. 5. 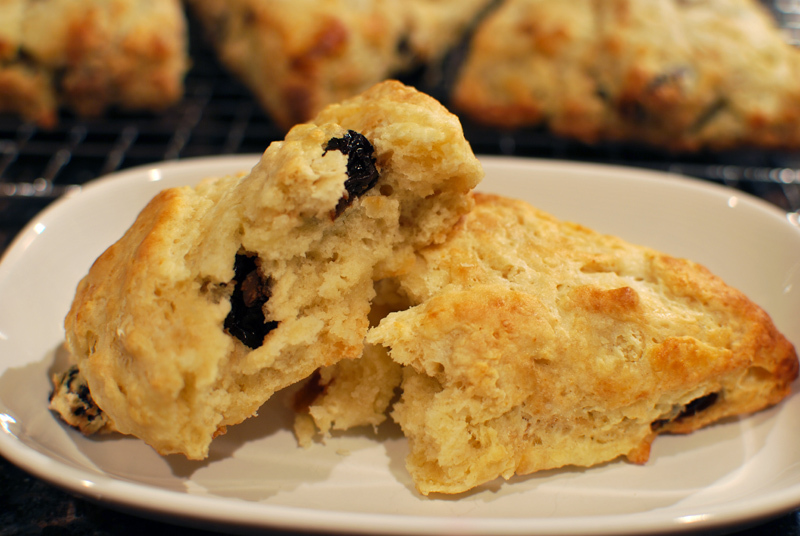 Bake the scones at 450° F for about 15 minutes, or until lightly golden on top. Let cool briefly on baking sheet before serving, or removing to a rack to cool thoroughly. 1. 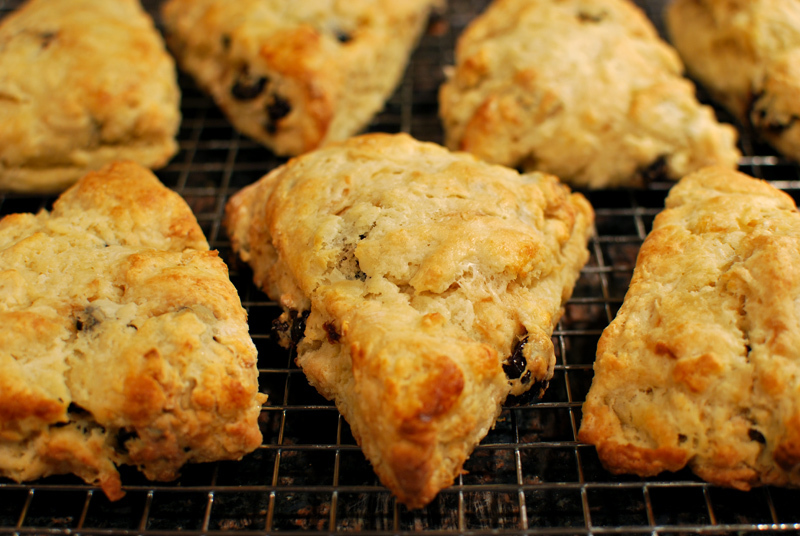 Scones are best served as soon as possible, but may be cooled thoroughly and frozen, wrapped well in foil, and reheated in a 400º F oven for about 5 minutes, or until warmed through. When I decided to stuff bread with Bourbon-braised pork, good barbecue was definitely an inspiration. 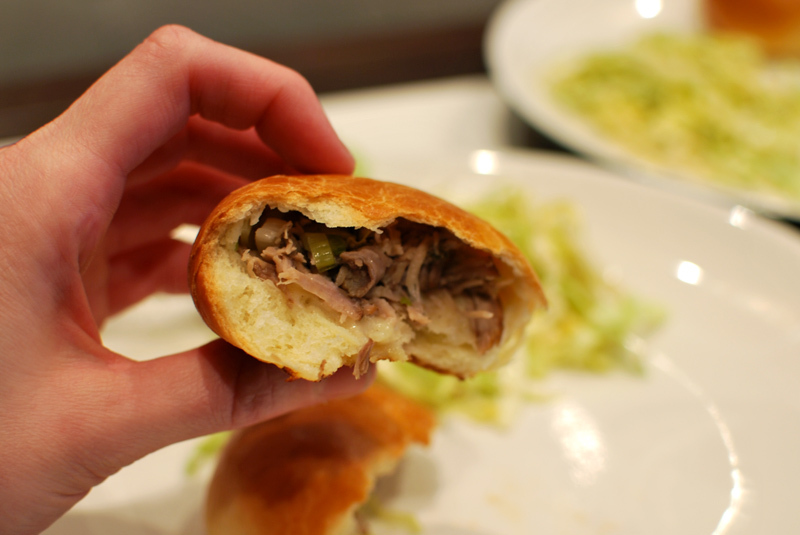 But the idea of pork-stuffed buns is decidedly Asian, so a fusion was in order. 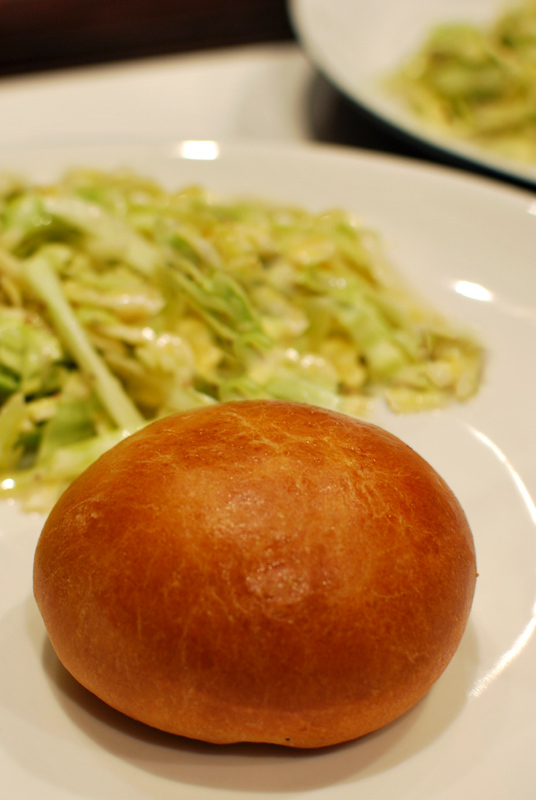 Cabbage is commonly served with pork across Asia, but it’s almost requisite with barbecue, in coleslaw form. So the flavor of the pork would be rooted in Southern barbecue, while the bread dough itself and the use of scallions would draw from the flavors of the Far East, with cabbage providing the bridge between the two worlds. The dough here is a soft one, lightly enriched with egg and butter for tenderness. Sweetness is added sparingly, just enough to complement the pork, but not enough to appear overall as anything less than savory. Brushed with an egg wash before baking, they emerge as golden brown orbs, giving little hint as to the treasure contained within. Inside, the pork has a rich and smoky depth from the Bourbon, one that is not necessarily obvious, but would certainly be missed, were the Bourbon omitted. The cabbage retains a subtle crunch, for a lovely contrasting texture, while the scallions provide a sharp freshness. These buns were delicious served plain, but would be equally good with a hoisin dipping sauce, if you like. 1. In the bowl of a stand mixer, whisk together the flour, sugar, yeast, and salt. Add the water, butter, egg, and honey. Using the dough hook, mix at low speed until a rough dough forms. Increase the speed to medium-low, and knead until smooth and elastic, about 6 minutes. The dough should be slightly tacky, but not sticky, and should clear the sides and bottom of the bowl. Add additional flour or water as needed to correct the consistency. 2. Transfer the dough to a large, lightly oiled bowl. Cover tightly with plastic wrap and let stand at room temperature until doubled in size, about 1 1/2 to 2 hours. 3. Lightly grease a large baking sheet, or line with parchment paper. Turn the dough out onto a lightly-floured surface, pressing gently to deflate. Divide the dough into 12 even pieces, and shape into round balls. Cover loosely with plastic wrap, and let rest for 10 minutes. While the dough rests, prepare the filling ingredients. 4. Using a rolling pin or your hands, and keeping the unused pieces covered, flatten each ball out to a flat round shape, using only as much flour as needed to prevent sticking. Place a tablespoon or two of the shredded pork in the center of the dough, and top with a little of the cabbage and scallions. 5. Pull the outside edges of the dough up and around the filling, pinching firmly to seal the seam. Transfer to the prepared baking sheet, seam side down. Cover loosely with lightly oiled plastic wrap, or a damp kitchen towel (not terry cloth). Let stand for 30 minutes at room temperature, until puffy but not necessarily doubled in size. Preheat the oven to 375º F thirty minutes before baking, placing a rack in the middle position. 6. Gently brush each bun with the egg wash, taking care not to deflate. Bake at 375º F for 20 minutes, or until well browned, rotating the sheet halfway through baking. Transfer to a wire rack to cool at least 15 minutes before serving. 1. Preheat the oven to 325º F. Set a suitable braising pan nearby (such as an enamel Dutch oven), and place the turnip wedges in it. 2. In a large heavy skillet, heat the oil over medium heat until hot but not smoking. Season the pork with salt and pepper. Place the pork in the pan and brown on all sides, about 3 to 4 minutes per side. Remove to the braising pan. 3. Add the chopped onion to the hot skillet, and cook until well colored and nearly caramelized, about 15 minutes. Add the bay leaf, thyme, and garlic. 4. Remove from the heat, and very carefully add the Bourbon. Take care to not ignite the Bourbon, which can happen easily. Return to the heat and simmer until reduced by about half. 5. Remove from the heat again, and add the wine or beer. Return to the heat and simmer until reduced by half. Add the chicken broth, and heat until just simmering. 6. Transfer the onion and braising liquid to the pan. Cover the surface with a sheet of parchment paper (to prevent the meat drying out), and cover with the pot lid or a tightly-fitted piece of aluminum foil. 7. Transfer to the oven, and bake for 1 1/2 to 2 hours, or until the pork is tender, and pulls apart when pulled gently with a fork. Remove the pork and let cool, covered, for at least 15 minutes before serving; or cool to room temperature before using in a recipe. 1. Buns are best eaten within an hour or two, but may be cooled 1 hour, then wrapped tightly and frozen, to be reheated in a 350º F oven for 10 minutes, or until heated through. 2. I used a bone-in piece of meat, but boneless is fine as well. If you use boneless, you can chop the pork into 2 inch cubes for slightly faster and a potentially more flavorful braise (due to the extra fond on the greater surface area). I’ll be honest; it didn’t feel like much of a challenge to turn a Bourbon ball candy into a quick bread. It basically went like this: find a good base recipe, add pecans, chocolate, and Bourbon. Voila! Bread! But to turn a Bourbon ball into a yeast bread? That’s a little trickier. What sort of dough should be used, all white flour? Some whole wheat flour? A rich dough? A sweet dough? A lean and hard-crusted dough? So much to choose from! Though a Bourbon ball is a tiny sphere of intense and rich sweetness, I decided on something a bit less sugary. To really focus on the excellent flavor combination of the inspiration, I chose to use a barely-sweetened dough, slightly enriched with eggs, buttermilk, and olive oil. It’s just lean enough to let the Bourbon, pecans, and chocolate shine, but not so lean that it can’t stand up to those sweeter flavors. The crust here is a fantastic shade of mahogany, shiny from the use of an egg wash. Inside, the crumb is close and moderately irregular, and tastes almost like a partly-whole-wheat bread (though it’s made entirely of white flour), due to the pecan “dust” that invariably forms when you chop them. The Bourbon creates a smoky backdrop, earthy and robust behind the dark chocolate and buttery pecans. Though this bread tastes excellent when sliced and toasted, the chocolate does have a tendency to melt and fall out like a fugitive on the lam; and let me tell you, melted chocolate is no fun to smell every time you heat up your toaster. If you’d like to toast it, I firmly suggest placing it on a flat pan in an oven or toaster oven. Otherwise, this half-savory bread is exactly what I was hoping for. 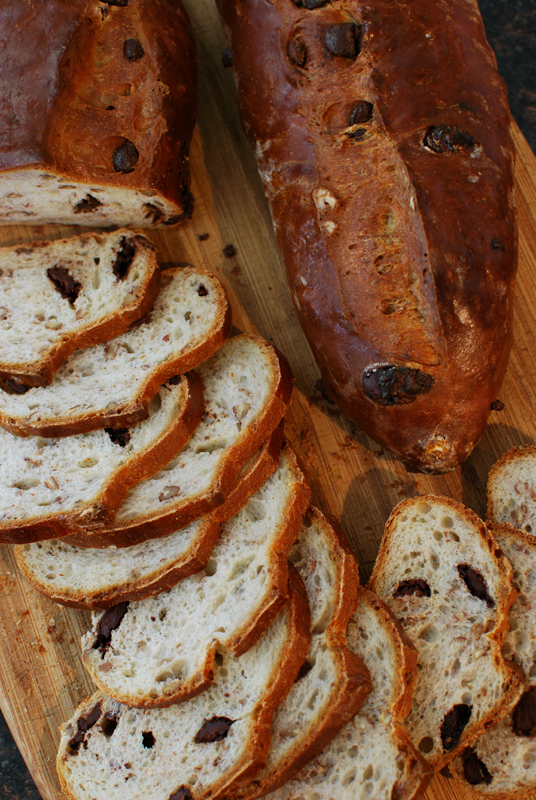 It’s a fitting tribute to that beloved candy, and is a bread that I’ll certainly make again. It was an unexpectedly wonderful pair with certain cheeses, i.e. quality ricotta, but a tangy goat cheese or a subtle brie would also be good choices. Maybe that sounds odd to you, cheese and chocolate, but I assure you, it’s delightful. And if you really have some of this bread lying around, it would make one heck of a bread pudding. Though if you actually have any lying around, call me up; I’ll come help you eat it. 1. In the bowl of a stand mixer, whisk together the flour, sugar, salt, and yeast. Add the eggs, buttermilk, olive oil, and bourbon. Using the dough hook, mix at low speed until a dough starts to form. Gradually add enough of the water to make a soft ball of dough and moisten all the flour (you may need more or less than the whole 1/3 cup). 2. Increase the speed to medium-low, and continue kneading until the dough is smooth and slightly tacky, but not sticky. If it seems too sticky or too firm, add additional water or flour as needed to correct the consistency. 3. Reduce the speed to low and add the pecans, kneading until fully incorporated. Add the chocolate chips, and knead until evenly distributed throughout. Transfer the dough to a large, lightly-oiled bowl. Cover with plastic wrap, and let sit at room temperature until nearly doubled in size, about 2 hours. 4. Line a baking sheet with parchment paper, or lightly grease. Turn the dough out onto a lightly floured work surface, and press gently to deflate. Divide the dough into two equal pieces. Press each piece into an oval shape, and roll up into a fat loaf shape, pressing to seal the seam. Transfer seam-side down to the prepared baking sheet. 5. Immediately brush each loaf with the egg wash, refrigerating the remainder to use later. Proof the loaves, uncovered, at room temperature until nearly doubled in size, about 90 minutes. Thirty minutes before baking, preheat the oven to 325º F, and place a rack in the middle position. 6. Brush the loaves a second time with the egg wash, taking care not to deflate the dough. Using a sharp serrated knife or razor blade, make one decisive slash lengthwise down the center of each loaf, letting only the weight of the blade press into the dough. 7. Bake at 325º F for 45 to 50 minutes, or until deeply golden brown, rotating the pan halfway through to ensure even browning. The center of each loaf should register around 185º to 190º F when fully baked. Transfer to a wire rack to cool completely before slicing. For me, one of the most highly-anticipated moments of the Christmas season has for years been the first taste of my Old Kentucky Grandmother’s famed Bourbon balls. In recent years, she has begun to supplement with peanut butter cups; but no matter how good those are, everyone knows the Bourbon balls are the real star of the show. They remain stashed away in the bomb shelter in her basement (yes, really), where they stay at an appropriately cool temperature. Family members will often run into each other down there, stealing away back upstairs surreptitiously with a smile and a full mouth, hoping to avoid the invariable-if-caught scolding. Each year, she seems to have to make more, and each year, she laments that there never seems to be enough to go around; all this, even though each of her family members is sent packing with at least two pounds of the cherished things. Bourbon balls are a purely Kentuckian confection, pairing the very Southern pecan with what may be The Most Perfect Flavor Pairing Known To Man, Kentucky Bourbon and good chocolate. Created by Ruth Booe in the late 30’s, the original Bourbon ball has a closely guarded recipe; and though you may see that most versions online include crushed cookies and corn syrup, I’ve personally never had one made like that. No, for me, the perfect Bourbon ball is simply butter, powdered sugar, and Bourbon-soaked pecans, all rolled into a ball that is dipped in chocolate. Proportions may vary according to taste, but the end result is invariably sweet, rich, boozy, and wholly irresistible. When I decided to make this beloved candy into a bread, it seemed only fitting that the bread should encapsulate all those qualities as well. 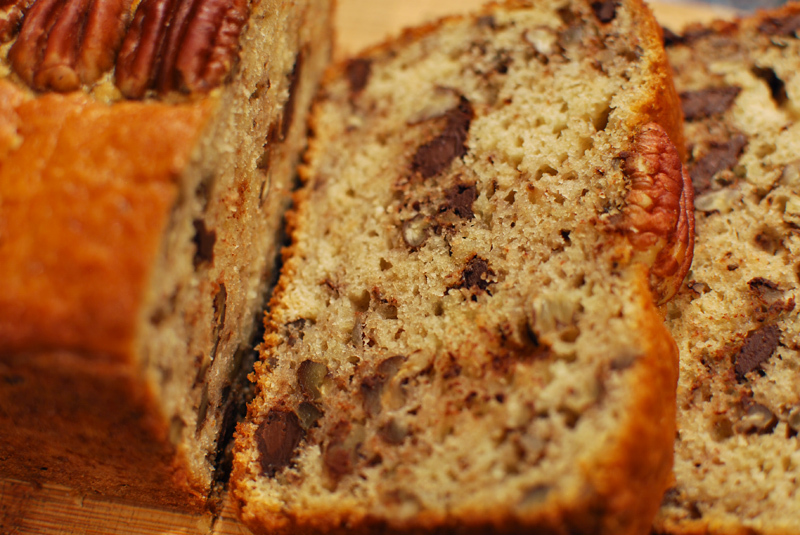 This bread, then, is a quick bread with loads of chocolate and pecans, supported by a background of smoky bourbon, and a slight tangy flavor from the use of buttermilk, for a little contrast. I’ve kept the sweetness less than it might have been — I’m not a fan of feeling food stick to my teeth hours after I’ve eaten it — but it’s certainly far from savory. 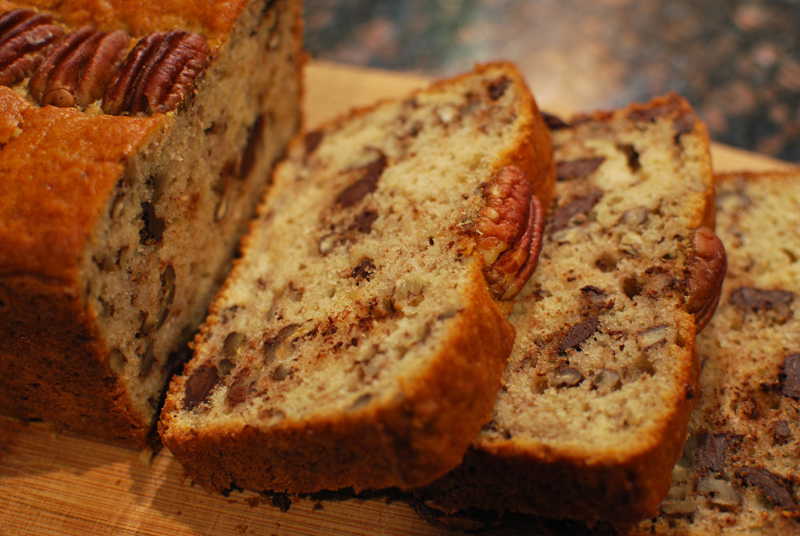 In keeping with the typical garnish of a single pecan half crowning the top of certain Bourbon balls, I’ve decorated the top of this loaf with a row of pecans, with the suggestion to cut each slice using the width of the pecan as a guide, each slice therefore giving a nod to its inspiration. Though no bread could ever steal the spotlight from a real Bourbon ball, especially those made by my grandmother, this recipe certainly does a good job at turning those ingredients and flavors into a loaf of bread. No, it won’t ever take their place, but it just might tide me over until I get my hands on the real deal. Now if you’ll excuse me, I’ve got a bomb shelter to raid. 2. 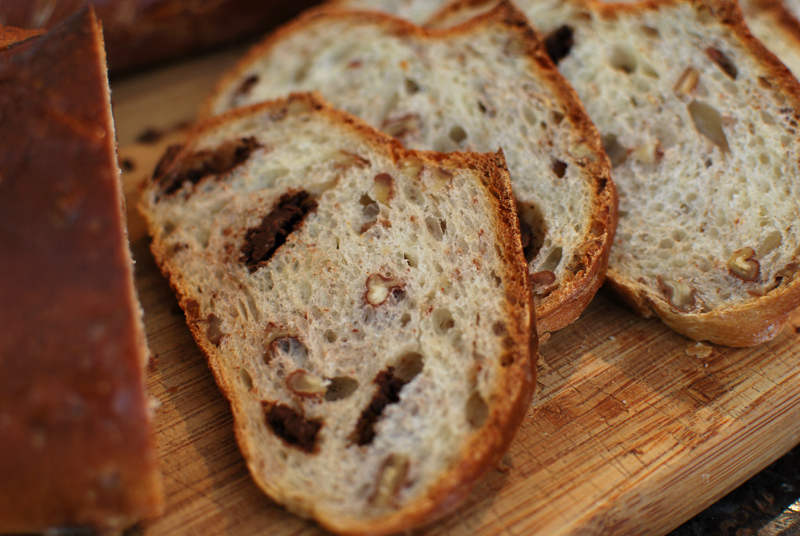 Spread the pecans in a single layer on a sheet pan, and toast in the oven for 5 to 8 minutes, or until fragrant. While still warm, chop, and set aside to cool slightly. 4. In a large bowl, or with an electric mixer, whisk the eggs with the sugar until slightly thickened, about 2 minutes. Whisk the butter in slowly. Add the milk, buttermilk, vanilla, and Bourbon. 5. Add the dry ingredients, and fold in gently with a spatula until the flour is mostly moistened. Add the pecans and chocolate, and fold in just until no more pockets of dry ingredients remain. Scrape batter into the prepared loaf pan, and smooth the top. Gently lay the whole pecan halves in a line lengthwise down the middle of the loaf, placing so the longer side of the pecan is parallel to the short side of the loaf pan. 6. Bake at 350º F until golden brown and the loaf feels firm when pressed gently in the middle, 45 to 55 minutes. Let cool briefly in the pan, about 5 minutes, before transferring to a wire rack to cool thoroughly before slicing. Once upon a time, I used to enjoy a glass of Scotch every so often. But then I moved to Kentucky, and I was shown the error of my ways. There, I was taught that Bourbon was the only civilized whiskey, and I came to prefer its burnt oak scent and caramel smoothness far more than the sharp peat and nip of even excellent Single Malt. These days, the Manhattan is my drink, and you’ll most likely find a bottle of Maker’s, Bulleit, or Woodford (if I’m feeling spendy) in the cabinet. I often sneak a splash or two into appropriate foods, especially chocolate items, or in place of vanilla in baked goods. Yes, Bourbon is my liquor of choice for drinking, but in cooking, it can sometimes be as indispensable an ingredient as salt. This week, I’ll be presenting breads that use Bourbon as a central ingredient, showcasing the versatility of the amber liquor, in sweet, savory, yeasted, and quick bread applications. First is a bread that highlights how well Bourbon and sweet corn go together. Bourboned cream corn is not uncommon in Kentucky (and other places in the South), so it was hardly a stretch to include Bourbon in a pan of cornbread. This recipe, originally from Peter Reinhart, makes a very sweet and cake-like Northern-style cornbread, which is right up my alley. 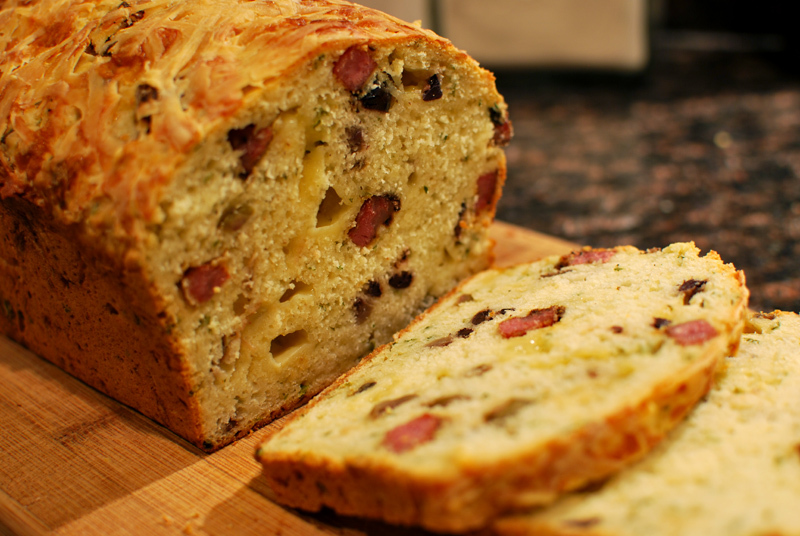 For an irresistible texture and added richness, this loaf is topped with handfuls of crisp bacon, which serves also to complement the smoky depth of the Bourbon in the bread. All together, the effect is nothing short of indulgent. Each crumb turns out moist and unapologetically sweet; this is not a cornbread for the faint of heart. But when you bite a fat wedge, crumbling golden onto your plate you’ll be glad you mustered the courage to try it out. 1. The night before making the bread, soak the cornmeal in the buttermilk. Cover and leave at room temperature overnight (or for 8 to 12 hours). 2. Preheat the oven to 375º F. Lay out the bacon in a single layer on one or two rimmed sheet pans. Bake for 15 to 20 minutes, or until just crisp. Drain the bacon on paper towels, and reserve the rendered fat left in the pan. When the bacon has cooled, crumble or chop it into coarse pieces. 3. Reduce the oven temperature to 350º F. In a medium bowl, whisk together the flour, baking powder, baking soda, and salt in a mixing bowl. Whisk in the white and brown sugars. 4. In a large bowl, lightly beat the eggs. Add the melted butter and bourbon, and whisk until smooth. Stir in the soaked cornmeal mixture. 5. Place the reserved bacon fat in the bottom of a 10 inch round cake pan, and place the pan in the oven. Heat for about 6 minutes, or until the fat is very hot. 6. Meanwhile, add the dry ingredients to the wet ones. Quickly and gently stir together with a large spoon or whisk until smooth. The consistency should look like thick pancake batter. Stir in the corn kernels until evenly distributed. 7. Remove the hot pan from the oven, and tilt to coat the bottom and sides with the hot fat. 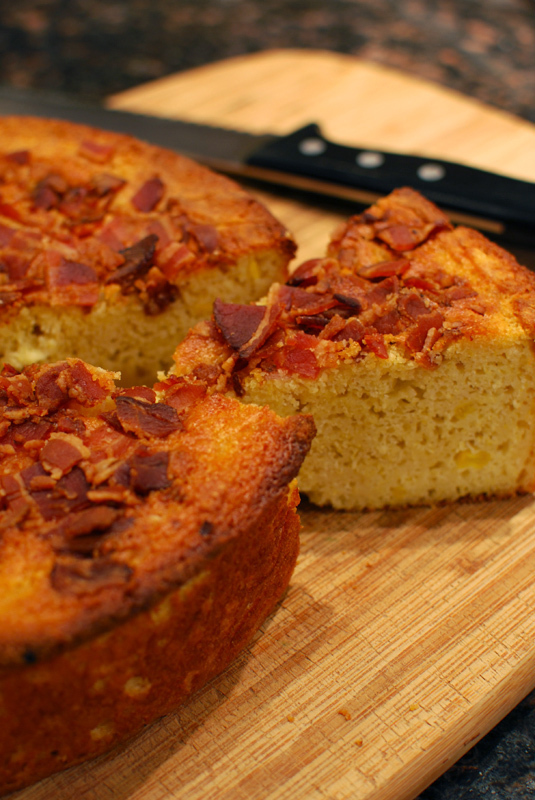 Carefully pour in the batter, and sprinkle the top evenly with the crumbled bacon, gently pressing it into the batter. 8. Bake at 350º F for about 30 minutes, or until the bread is golden brown and baked through. An instant-read thermometer should register about 185º F when fully cooked. Let the bread cool in the pan for at least 15 minutes before slicing and serving. 1. This bread is best served as soon as possible. It may be cooled completely on a wire rack, wrapped tightly, and frozen, to be reheated in a 350º F oven for 10 minutes, or until warmed through. 2. If using frozen corn, it does not have to be thawed before using. Cheese, for the typical American home cook, is most often thought of as a savory item, and is duly relegated to a supporting role in pastas, salads, or pizzas. Occasionally, a very fine example is offered a prime solo spot, starring as an hors d’oeuvre, with the requisite chorus line of crackers as backup. In most homes, cheese and sweet flavors are rarely combined, the idea of cheese as dessert totally foreign, even approaching unpalatable for many. But then, there is the Northern predilection to top a slice of apple pie with a bit of sharp Cheddar; and in fine restaurants from coast to coast, it is on the dessert menu where diners will find the assiette de fromage, usually garnished with the intense sweetness of honey or dried fruit. And when you take cream cheese frosting into account as well, without which our red velvet and carrot cakes would surely be naked, the idea of sugary cheese seems far more obvious. So after five days of savory cheese-laden breads, this last cheese bread revels in the sweetness of cheese, with a cheese you might not typically consider. Ricotta is one of the more overlooked cheeses out there, usually bought only to make lasagna or ravioli. But good ricotta is absolutely able to stand alone, as any brie or blue can; simply combined with honey, a bowl of ricotta can be as sumptuous a dessert as chocolate mousse. Here, I’ve combined honeyed ricotta with Marsala-soaked golden raisins, and stuffed light brioche buns with the mixture. 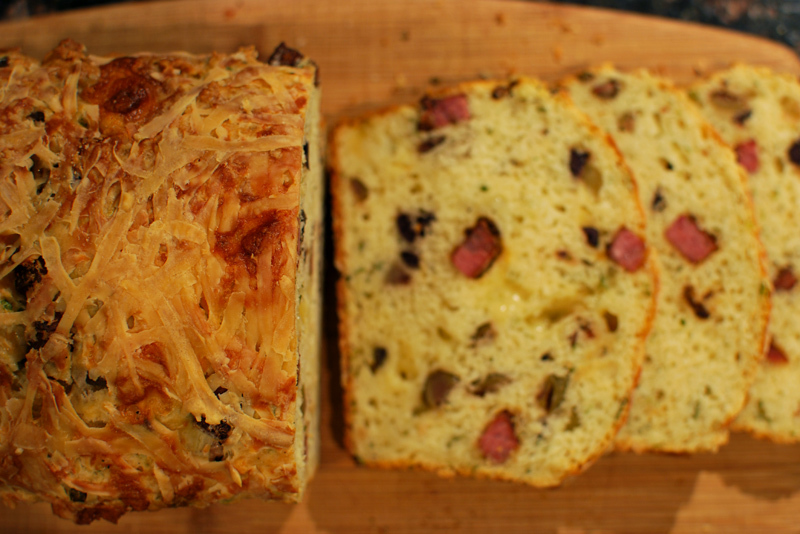 The resultant bread is certainly far from savory, but it isn’t sickly-sweet, as many desserts can be. Unassuming to look at, the buns’ smooth exterior belies the creamy filling inside, which has the occasional tendency to spill over onto your hands and invite modest finger-licking. 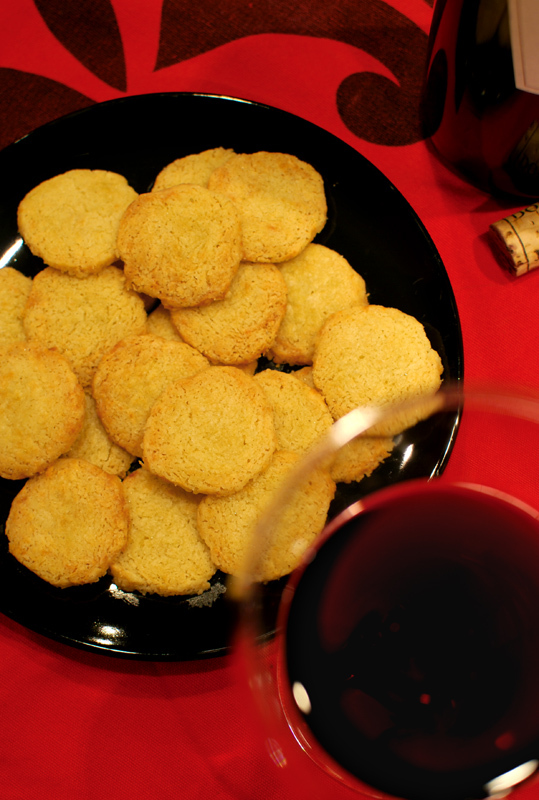 The soaked raisins pop with bursts of wine, adding a sultry flavor to the complex honey sweetness. The dough used is an enriched, mildly sweet one, which produces a soft and fluffy bun, takes just a little more time than the standard straight-dough method, but the excellent flavor is well worth the minimal extra effort. A sort of light brioche, it’s sturdy enough to support the filling and subtle enough to complement the real star of the show, the ricotta. I recommend finding the best quality ricotta you can for this, as the insipid flavor and watery texture of most supermarket brands will do nothing for you. Or, if you’ve been so inspired as to make your own (which is much, much easier than you might think), this is a perfect application. 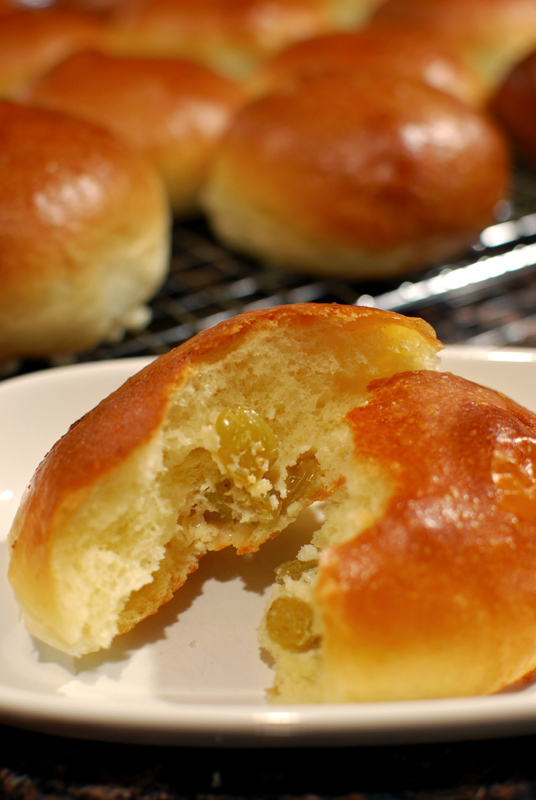 Perfect for a half-savory dessert, or a quick and special breakfast the next morning, these sophisticated little buns might just charm their golden way into your repertoire. 1. To make the filling, place the raisins in a plastic zip top bag. Add the Marsala, and squeeze as much air as possible out of the bag before closing. (This maximizes the surface area contact between the raisins and the wine, and makes sure no raisins are left dry.) Soak the raisins for at least 2 hours, but preferably overnight. Drain well, and mix into the ricotta with the honey. Cover and refrigerate until ready to use. 2. To make the starter, whisk together the flour, yeast, and milk in the bowl of a stand mixer. Cover with plastic wrap, and let stand at warm room temperature for about 45 minutes, or until very risen and beginning to fall. 3. To make the dough, whisk the eggs and honey into the starter. Add the flour and salt, and mix with the dough hook on low speed until all the flour is moistened. Turn the mixer off, cover the bowl loosely with plastic wrap, and let stand for 5 minutes, without removing the dough hook or the bowl. 4. Turn the mixer to medium-low, and gradually begin to work in the butter, adding about 1 tablespoon at a time. Let each piece of butter incorporate before adding the next one. Turn the speed to low, and continue kneading for 6 to 8 minutes, or until the dough is smooth and clears the sides and bottom of the bowl. If the dough sticks to the sides or bottom, add additional flour by spoonfuls until the correct consistency is achieved. 5. Turn the dough out onto a very lightly floured work surface. Pulling the outside edges into the middle, shape the dough into a round ball. Transfer to a large, lightly oiled bowl, turning to coat all sides of the dough with oil. Cover tightly with plastic wrap, and let rise at room temperature until doubled in size, about 90 minutes. Twenty minutes before shaping the buns, set the ricotta filling out at room temperature to take the chill off. 6. Turn the dough out onto a lightly floured work surface, pressing gently to deflate. Divide the dough into 16 even pieces, shaping each into a round ball. Cover loosely with plastic wrap, and let rest for 10 minutes. Lightly grease a large baking sheet, or line with parchment paper. 7. Using a rolling pin or your hands, flatten each piece of dough to a flat round. Place 1 to 2 tablespoons of the ricotta filling in the center. Pull the dough up and around the filling, pressing firmly to seal the seam. Transfer the bun seam-side down to the prepared baking sheet, and cover loosely with plastic wrap. Repeat the shaping with the remaining dough and filling. 8. Let the buns rise at room temperature, covered, until doubled in size, about 1 hour. Thirty minutes before baking, preheat the oven to 400º F, placing a rack in the middle position. 9. Gently brush each bun with the egg wash, taking care not to deflate. Bake the buns at 400º F for 15 to 20 minutes, or until well browned, rotating the pan halfway through to ensure even browning. Remove to a wire rack to cool about 1 hour before serving. 1. If you prefer, in place of the Marsala, you can use a mixture of 2 tablespoons brandy with 2 tablespoons water; or you may use fruit juice (apple, orange, pomegranate, etc.) for a non-alcoholic option. 2. If your ricotta is very watery, you can drain it in a coffee filter or paper towels, in colander set over a bowl and refrigerated overnight. Otherwise, you can substitute sugar for the honey in the filling, which will not add extra moisture. Parmesan, that buttery, nutty, and hard grating cheese, has a unique melting characteristic among cheeses. When heated and cooled, a pile of plain parmesan slumps into a crisp, almost crackerly thing. Called a “frico” when prepared thusly, it’s something like what I was expecting from this recipe. The word “biscotti” literally means “twice-cooked”, which these are certainly not. You might call them “unscotti” (once-cooked) if anything, except that anything similarly named invariably refers to a sweet cookie, cut from a long loaf of baked dough (unscotti are then served as is, biscotti are cooked a second time until hard and crunchy). These crackers, on the other hand, are made from a reasonably even mixture of flour, butter, and parmesan cheese. No sugar is used, just a bit of rosemary and pepper for some interest. The dough is shaped into a log, chilled, then sliced and baked. How they’re meant to be similar to a biscotti is beyond me. 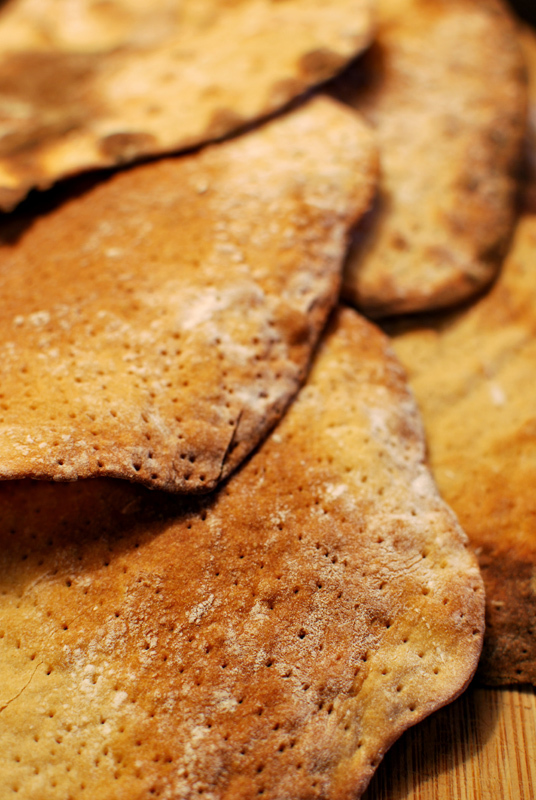 Having gotten that semantic chip off my shoulder, I will say that Ms. DeLaurentiis has provided a delightful recipe for delicate, softly crumbling crackers that are indeed replete with parmesan flavor. They aren’t at all crisp, as I might’ve expected, but the texture is really exquisite. A bit too soft to serve with any sort of dip or spread, these crackers make a nice wine or cocktail hour pairing, and are a delightful garnish for soups, especially your favorite tomato soup. And though the parmesan is really the star of this show, the dough provides a great blank canvas to experiment with different herb flavorings. I used the originally suggested rosemary, as I adore rosemary and parmesan together; but parsley, basil, mint, oregano, or marjoram would also be natural pairs. Fresh or dried would work equally well, and any herb mixture would also work beautifully. 1. In a medium bowl, whisk together the flour, rosemary, pepper, and salt. Add the butter and Parmesan, and combine with a spatula or hands until crumbly, but sticks together when pressed with fingers. If dry spots remain, drizzle in a little milk or water until all flour is moistened. 2. Turn dough out onto a sheet of parchment or wax paper, and form into a log about 1 inch in diameter, using the paper to help shape the dough. Wrap the log with the paper, twisting the ends to seal. Place dough in the freezer to chill for 1 hour. 3. Preheat the oven to 350º F, using convection heat if available. Remove the dough from the freezer and allow it to sit at room temperature until the oven is hot. Line a large baking sheet with parchment paper. 4. Cut the log of dough crossways into rounds 1/2 inch thick. Transfer the rounds to the prepared baking sheet, about 1/2 to 1 inch apart. Transfer to the oven, and bake for 10 to 15 minutes, or until just beginning to color around the edges. Let cool on the baking sheet before serving. 1. The volume measurement of the Parmesan will vary wildly, depending on how finely you grate the cheese. A coarse grater will give you less than 1/2 cup, while a fine Microplane-style grater will produce almost 1 cup. The more cheese you use, the crisper the crackers will be. 2. If you have fresh rosemary, chop it finely and increase the amount to 1/2 teaspoon. Oh, my goodness. I knew this would happen. I’ve been juggling so many different bready things these last few weeks, between developing and baking a new recipe each day, photographing each one, writing about each one, and with no sensible order to it all, that I’m surprised it hasn’t happened sooner. Yes, I’ve forgotten to photograph this bread. But can you imagine a popover? Like this one, or this one? Then you have a pretty good idea of what these look like. The only difference is that these turned out a bit darker on the outside, due to the browning abilities of the cheese added to the batter. Got that mental image? Right then, on we go. Originally, this recipe called for the batter to be baked in mini muffin tins. And after trying them in a standard 1/2 cup size muffin tin (aka: the only muffin tin I have), I agree. These weren’t the greatest popovers ever made, because of the cheese. See, popovers are leavened with steam alone, meaning that the large percentage of liquid in the very wet batter turns to steam, which inflates the starches (as they set in the oven’s heat) like a balloon. When you add anything to the batter (such as cheese), it weighs the batter down a bit, so the popovers won’t get quite as inflated as they would without the extra ingredient. Ergo, if the steam leavening the batter doesn’t have to lift very much batter (as it wouldn’t in smaller portions, like in a mini muffin tin), then the popovers will be lighter and fluffier. Since I baked them in larger portions, the steam, however powerful it might be, just couldn’t leaven the poor things as much as possible. So, Gentle Reader, you may want to use your mini muffin tin for this recipe. Assuming, of course, you have one. Other than the less-than-ideal leavening, these popovers were quite good. The flavor was rich and deep, and the texture appropriately crisp-crusted and tender inside. The interior was perhaps a bit too moist for perfection, due again to the cheese, but not unpleasantly so. Overall, this is a good popover recipe, if you must have cheese. For me, I’ll take the airier plain popovers, thank you very much. 1. Whisk together milk, eggs, 1 tablespoon butter, flour, salt, and pepper until smooth. Add cheeses and chives, and whisk to combine. Cover tightly, and chill 1 hour to allow the batter to rest. 2. Preheat the oven to 425°F with a rack in upper third. Grease 10 cups of a standard muffin tin, or 6 cups of a popover pan, with the remaining 1 tablespoon butter. 3. Gently stir batter, then divide evenly among the prepared tins (they should be about two-thirds full). Bake at 425º F until puffed and well browned, 35 to 40 minutes. Remove from oven, and quickly cut a small slit in the side of each popover. Return to the oven for 5 minutes. Remove from the tins and serve immediately. 1. Batter can be made 1 day ahead and chilled. 2. Popovers may be baked and cooled on a wire rack, then frozen for up to 3 weeks. Reheat unthawed in a 350º F oven until heated through, about 5 minutes. 3. Maybe you should try this in a mini muffin tin. In this case, you should get around 24, and bake them for only 18 to 20 minutes.